BMW seem to be increasing their product range to match the sort of variety offered by mainstream brands like Ford and Vauxhall, with multiple cars in each segment and lots of choice at each price point. 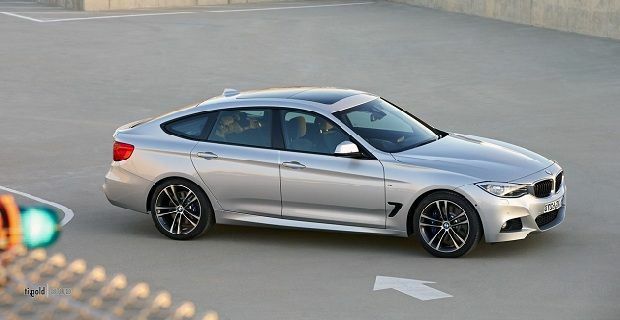 Over time that may compromise the brand’s image but new models like the BMW 3 Series Gran Turismo will help increase sales. The hatchback version of the 3 Series will make its debut at the 2013 Geneva Motor Show next month. Like the 5-series Gran Turismo, it’s a cross between the saloon and touring version so offers some of the practicalities of the touring with less compromise made to the styling. At 4284mm, it’s 200mm longer than the Touring. It also has a longer wheelbase and it’s 81mm taller. In fact there are so many changes to the exterior that none of the body panels are shared with the Touring or Saloon variants. The headlights and grille are familiar but even they have been redesigned. At the rear, where the styling looks more like the 5 Series Gran Turismo than any existing 3 Series, there’s an active spoiler that raises at high speed and at the front, the front wings have upside down L-shaped vents that look like they were lifted from the 4 Series concept. Inside the cabin there are very few changes to the existing 3 Series interior, but the extra height and length of the Gran Turismo means that the seating position has been lifted by 59mm and there’s an extra 70mm of legroom. The 40/20/10 split for the folding rear seats is standard and overall there’s an extra 25 litres of boot space in this version. The 3 Series always seems to be in the top five of UK new car sales, thanks mainly to company car owners, but with all the extra space inside, perhaps this is a 3 Series aimed at the rest of the market.